One of the most powerful Yin cures in Feng Shui. The salt water cure has always been kept a closely guarded Feng Shui secret up until about eleven years ago when we released the formula. This cure has been copied by everyone nowadays although many people purchasing the cure from other Feng Shui websites are receiving the wrong information and are placing them incorrectly. Regardless of where you purchase this powerful cure from, it is vital to get it correct because when this is used incorrectly this extremely powerful cure can have a very negative effect. I have been using salt water cures in my home and office for over thirty years now for the amazing results you will see when you place it correctly. This is an extremely fast working cure when placed correctly to tackle sickness, loss of money and bad luck. This cure is used for the #5 and #2 stars, so this year (2009) you must place the cures in the West and north but also place them wherever needed on your fixed flying star if you have an accurate natal chart. 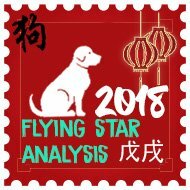 If not, it may be worth considering our software as it will calculate the flying stars automatically for you alongside many other advanced Feng Shui formulas. In 2009 the #5 star and #2 will be located in the west and north. With the #5 being in the west this year, this will activate sickness and misfortune and the #2 in the west will activate sickness, so it is vital to place the salt water cures in these areas to keep the stars from activating this year. The software will come in useful for 2009 and the next 15 years ahead as it gives advice on cures and enhancers. In traditional Feng Shui you do not have to cure every part of your home. If the #2 or #5 stars fall in a bathroom, utility room, cloakroom or other room that you do not use often then you do not really need a salt water cure. If it falls in a lounge, bedroom, office or other commonly used room then you need to set up a cure. Q) With the annual and monthly stars doubling up in July 2009 do you think I should replace my salt water cure? A) Personally I am replacing both my salt cures in the north and west (especially the north) as in July the stars are doubled in good and bad. My north #5 star is heavily crystallised this year as this is at the front of my home and this is not good. Q) Can the salt water cure be covered up or placed in a cupboard out of sight? A) The simple answer is No. If you cover or hide the salt water cure away it will not absorb any of the negative energy of the property and the crystals will not form to their full potential If at all. Always place the salt water cure where it is exposed to the air (qi). Q) I set up my salt water cure in February 2009 (now June 09) and the crystals are now hanging over the sides of the glass and have even broken away, should I replace the cure? A) I would recommend replacing it as it is clearly working very hard and absorbing all the negative energy for the crystal formations to be breaking away. The more the crystal formations grow, the more negative energy the cure is absorbing. This does not apply to the six coins tied with red ribbon as these work on a different level. Q) I really do not want visitors to my home or business to see the cure, what can you recommend? A) Many of my clients ask me this question as they require cures to be discreet and out of sight, I always tell them that their home does not need to look like a Chinese restaurant to have good Feng Shui. I would suggest placing the salt water cure up high on a shelf or cupboard and placing a photo frame or ornament in front of it to hide the cure as long as the glass/jar is exposed to the air. Make sure to regularly check the salt water cure as it may need to be topped up with water, especially in the summer months. Q) What kind of salt should I use for the cure? A) I have clients who have used normal coins without any positive results,so I would advise using Chinese i-ching coins. The coins we sell are superb quality and come from a good dynasty which is very important. The four Chinese characters should be face up; this is the yang side of the coin. 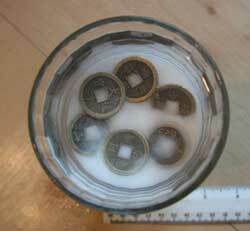 A) We use six i-ching coins because six is the Trigram for Chi’en and this is a metal element and weakens the negative earth of the #2 and #5 stars. This is the same reason we use six Chinese coins tied in a row and a six rod metal wind chime. These are parts of the formula that other practitioners do not know about and this is why so many websites just try and sell the cure without adhering to all of the above. Q) Should you only use a salt water cure for the annual 2 & 5 stars? A) Absolutely not, If you have done a natal chart on your property and you know where the fixed #5 and #2 stars are you should also use a salt water cure here as this Is even more effective at reducing bad luck and sickness. 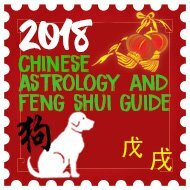 If you are not sure how to do a natal chart I would recommend our Feng Shui software as this not only calculates your natal chart for your home or business but it also gives advice on colours, cures and enhancers for every part of your property. The software is used in every part of the worls by Feng Shui masters, practitioners, students and enthusiasts; it is our pride and joy. Follow this link for more details Feng Shui software. A) This is a very popular question and the answer is no, a salt water cure is fine in a bedroom and any other room in the home, having a salt water cure in your bedroom is no different to having a glass of water beside your bed each night. This is called a “yin” water cure. 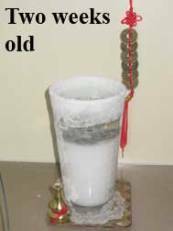 The type of water you do not place in a bedroom is a “yang” water cure like an aquarium ofrwater feature with a pump, the water movement creates yang energy and this is harmful in a bedroom. So a salt water cure is needed in a bedroom for the annual stars and also fixed stars as these cause even more problems to health and luck. A) this depends entirely on the amount of negative energy around your home, we have clients who change their salt water cure three to four times a year because the crystal formation becomes too much and is on the verge of snapping off. Other clients only need to change them once a year and this will always be on Chinese new year. 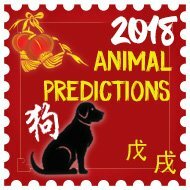 Although they should be changed on Chinese new year they can be set up any time of the year. A) I usually use a normal size pint glass that would be used in a pub. If you are from a country that is not familiar with pint size, it is a glass container around 750cl in volume. I prefer to use a glass container, although I have many clients who use similar size coffee jars with great results, I would recommend a glass pint glass as it is perfect size as the top is exposed to the air. A) This is quite common and should be avoided, having this cure in a building is a bit like having a bee’s nest in your home or business, it will be peaceful until it is disturbed, but as soon as it gets knocked the bees will come out and sting you. If the salt water cure is only a few months old then it should be okay, but if the cure is over three months old and has a lot of crystallisation then it should be thrown away and renewed as you will have disrupted the negative energy. When you place the cure try to pick somewhere that it will not be disturbed or knocked. 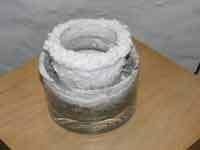 Also be careful when you are cleaning around the jar and do not get tempted to pick the crystals off of the rim. A) It is good to have metal cures close to the salt cure as these will also weaken the negative earth. 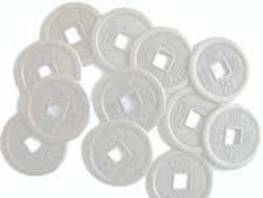 Good metal cures consist of a wu lou, six Chinese coins tied in a row with red ribbon, signing bowl etc, if you follow this link you will see more examples of metal cures. 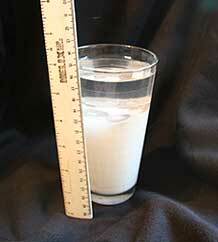 Fill up a glass jar or pint glass with table or rock salt to about three quarters full. 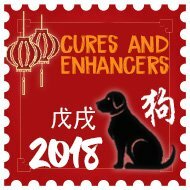 A) You should throw away your salt water cure at the end of every Chinese new year as they store so much negative energy. It is best to carefully place the cure in a Tupperware type container and seal the lid then throw it straight away. If you do not have a container, tip the water away down an outside drain that leads away from the house and is in the back, then place the cure in a plastic bag and place in bin. Do not recycle the coins or container as this will bring the negative energy back into your property. A) I was sent the link to this website and many others over the years and they are still selling the same cure which is identical in appearance to ours although the information they give is very dangerous, we sell the salt cures at a very realistic cost to ensure most people can afford them. Follow this link for details on purchase.